How disruptive is your small business? 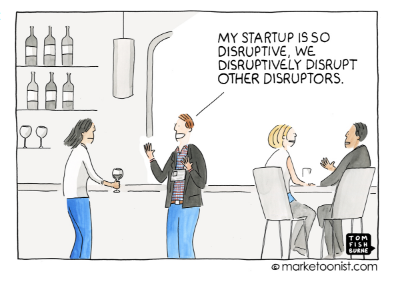 For many of us, the word “disruption” does not sound particularly good. We perhaps associate it with unruly behaviour at school, problems with our commute to work, or a home improvement project that is taking rather longer than we had planned! But in terms of your small business disruption is good! In fact, you should want to be a disruptive business! In business terms a disruptive business is one that creates a new market and eventually disrupts the existing market and established market leaders and networks. It enables a business to grow from perhaps a simple product at the bottom of a market and then relentlessly move up market, eventually displacing established competitors. The term was introduced by Clayton M. Christensen of Harvard University in 1995. One of the key features of disruptive businesses is that by a combination of innovation and simplicity they can enable a whole new population of consumers at the bottom of a market to access a product or service that perhaps has so far only been accessible to consumers with either a lot of money or a lot of skill. Revolut: a money app and payment card company that has gained over 60,000 active users in just one year with an app that enables people to spend or transfer money in any currency without incurring commission charges. Touchnote: an app that converts camera phone photos into postcards or greetings cards to print and post, therefore enabling more meaningful communication between people. What3words: a plug in code for apps and services, that allocates them a three-word address that can be used in GPS and navigation systems. The funding will will be distributed through Innovate UK, in a series of competitions encompassing areas including sustainable energy, modern urban living and healthcare technology. 1. Investigate how businesses in other sectors are using technology in innovative ways. You may find that there is some technological development that would benefit your product or service but is not yet being used in your industry. 2. Don’t be afraid to be disruptive ie to try new things. Small businesses can be concerned that putting efforts into something new could jeopardise their current success - and obviously risks do need to be weighed up. But if you spot a disruptive opportunity and don’t take it then someone else is likely to! 3. Never take your eye off the competition! Be ready not only to match but also to exceed any innovative actions on the part of your competitors. Try to get into the disruptive mindset and keep ahead of the game. 4. Even more important, remember to listen to your customers! Customer feedback is the best indicator of what you need to do next. It can act as an early-warning system, enabling you to react in real time to changes in the market and ensure that your products and services keep up with these. If you need additional business funding to move your business into a more disruptive phase then why not get in touch with us at Fair Business Loans? We have a passion for business so let’s see if we can help you and create some disruption together!